Urgent humanitarian aid is needed in Puerto Rico. 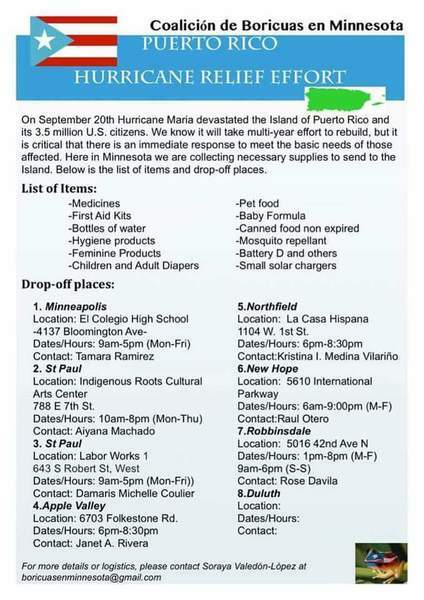 A coalition of individuals and groups in Minnesota have banded together to send relief efforts: Coalition de Boricuas en Minnesota. A drive is underway to fill a plane with supplies that will leave Wednesday morning from MSP. The devastation from Hurricane Maria is unimaginable. This is a boots-on-the-ground effort to bring resources to local neighborhoods. La comunidad Puerto Riqueña en Minnesota está haciendo todo lo posible para enviar agua y otras necesidades a la isla. ¡Necesitamos su ayuda! We need your help. Send resources or donate—help in whatever way you are able. Drop items off at the Indigenous Roots Cultural Arts Center, Saturday, Sept. 30 through Tuesday, Oct. 3, 10 a.m. - 8 p.m., or at the Circle of Discipline in Minneapolis, between 4-8 p.m. There is also a fund set up at the St. Paul Foundation for long-term hurricane relief. Donate now. If you are able to help sort, inventory and package Tuesday afternoon or evening call Aiyana Machado at 612-702-9058. For more info contact Soraya Valedon-Lopez at boricuasenminnesota@gmail.com. Flight coordination by coalition member Aiyana Machedo, Director/Founder of Bomba Karaya Guey.